By applecupcake on October 3rd, 2010 . Filed under: Cupcake Ideas, Decorating, Tips . Do you want to learn the secret behind 3D chocolate decorations? Well I am about to tell you. Well actually not me but The Lone Baker. If you have not heard of her, she is worth finding out about. 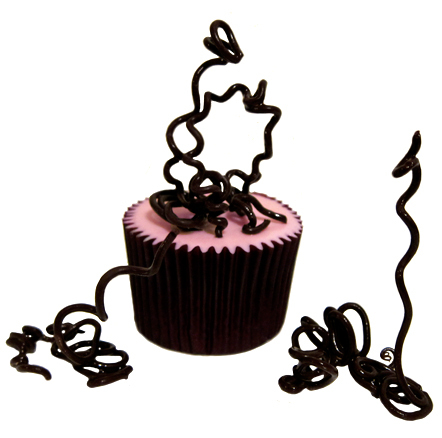 Her whole website is dedicated to amazing tips and tricks to do with cupcake decoration and did I say she is amazing? So to the 3D chocolate spirals, well, the trick is Vodka, but I don’t want to shatter the mystery, take a visit to her site to check it out. You may have piped chocolate swirls onto baking paper before, but they are flat, two dimensional pieces, where as these, well you see!